It is sad indeed to read the list of ingredients on store bought 'bread'. I put it in quotation marks purposely, because it doesn't even resemble real bread. When I came to the States and saw Wonder bread for the first time, I was wondering how anyone can eat it. For many years my family bought bread at the local Russian store, a nostalgic tradition. Then once I got married we bought artisan breads at a regular grocery store until I found Trader Joe's Tuscan bread, a great value and delicious taste. But now, you can't really beat the value of homemade bread, twice the amount for half the price! Yes, it is a time investment, but certainly worth it if you have an hour to spare. Baby E has been 'helping' me with this for about a month now. I give her a bun size piece of dough and put some flour in a tray. She could play with it for hours, that is if I didn't take it away before she tries to eat the whole thing! Sift together flour, yeast, and sea salt, mix, pour in warm water. Stir with large wooden spoon. Add water if the dough is too stif. Sift some flour onto a clean table or large cutting board, place the dough there and knead it by hand carefully. Coat a deep vessel with olive oil (or canola), place the dough in it, cover with a towel and place in a warming drawer for 1 hour (the oven is ideal, just heat it up for one minute or less at 300*F prior to placing the dough there). I don't usually wait a whole hour because the dough 'runs away', half an hour is sufficient for us and we like the bread a tad more dense. Place back in the deep vessel and put in warming drawer for another hour. Preheat oven to 250 C (480 F). Put some flour on a baking sheet, place the risen dough on it and form a round loaf. Bake for 10 minutes, reduce heat to 220 C (430 F) and bake for another 30 minutes. Baking times may vary with your oven. Let cool, cut a slice and enjoy yummy homemade bread with some preserves or your choice of topping! Make half of it with grated cheese for hubby! Tips: We make ours in a rectangular, ceramic bakeware from Emerson Creek Pottery. It doesn't all fit so we take about a third and make a round loaf on a baking sheet as well. If you live alone you might want to half the recipe. I actually have a kitchen scale and weighed all the ingredients, but found that I needed more warm water than the recipe calls for. This recipe has no dairy ingredients, you can try a variation that does. I think a bit of honey would not hurt either. The Trader Joe's bread that we used to buy has pretty much the same ingredients plus a bit of honey. I highly recommend King Arthur flour though, it is great quality with consistent results (in my other baking ventures at least). Make sure you have fresh, high quality yeast, it makes a big difference. 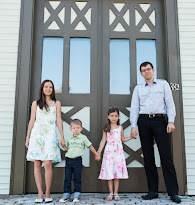 This can be a fun project if you have children (as you can see in the photos. You can have them help with kneading the dough and make it a weekly activity to do together. You don't need a breadmaker for this either. Have fun and send any tips my way if you are a seasoned bread maker! Made some and it turned out perfect,thanks. I never made my own bread before. This one seems simple enough. Will be trying this. I love making my own bread! the little ones always get excited too, because then they have a little play dough time. =) What cute pictures of your daughter enjoying it! 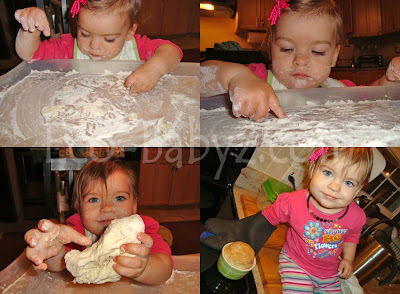 baking bread with my daughter is definitely on my to-do list this winter... bookmarking your recipe! Love your bread! I've always wanted to try making my own bread and with your direction it looks like it is totally do-able! love the idea of adding Rosemary! Delish! I've always wanted to try making my own bread! the whole rising and kneading thing is a bit intimidating to me but with these directions it looks totally do-able. and LOVE the idea of adding Rosemary! delish.